Here's something you don't very often, a 1982 Fiat Spider Turbo. The Spider Turbo did not leave the Fiat factory as a turbocharged car. Fiat commissioned a New Jersey based company called Legend Industries to add the turbocharger and all its ancillaries after the car arrived in the US. The turbo added around 20 more HP to the Fiat 2.0 liter engine, a gain, but probably not enough of a gain to warrant the extra cost and maintenance of the turbo. Only 700 of these cars were built and very few survive. The Turbo Spider had all the virtues and vices of the normally aspirated Spider. You really can't talk about a Fiat without mentioning rust. The Spider rusted just like all seventies and eighties Fiats did. Fiat electronics were not the best and the cars tended to have cooling problems. A lot of the trim was cheaply made and little things tended to break. On the plus side, Fiats handled incredibly well. The 2.0 liter engine loves to rev and makes all the right Italian engine sounds. The interior is well laid out, great looking and comfortable. The top was well designed and could be raised or lowered with little effort. Fiat sports cars still have a large following in the US and most parts can be found at specialty vendor's websites. Some trim pieces are getting a little tough to find. The car being offered on eBay appears to be in very nice condition. It's a Texas / Arizona car and, according to the seller, shows no signs of rust. The suspension has been rebuilt, it has an ANSA exhaust, new filters, a couple of new fuel injectors, new O2 sensor and much more. It has a few minor problems (i.e. bad wiper motor, some faded paint on the hood), but nothing serious and nothing that would prevent you from driving the car the day you get it (as long as it's sunny and you don't need to use the wipers). This is not a car for everyone. If you're just looking for a Spider to drive once in awhile and don't want to spend a lot of time and money on maintenance, buy a normally aspirated Spider. If you're looking for something unique, with a ton of "ooooh factor" (as in "Ooooh it's a Turbo Spider") and don't mind putting some extra little care and maintenance into a car, a Turbo Spider is just the right car. 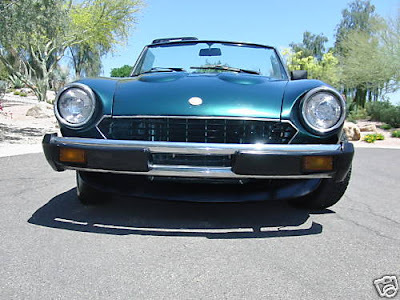 Click here to find Spidercenter.com - It contains a wealth of Fiat Spider information. Putting a heat producing turbo in a car that already had cooling problems for an extra 20 horse power? That makes no sense. They could have gotten the same extra horspower with a different air box and exhaust. It's great that this car survived, but it sounds like a car that gives you a lot of pain and very little gain. Some of these even had an automatic transmission. Fiat was losing sales big time in the USA and needed to do something. Turbos were all the rage at the time and now the car had (almost) the power to haul around A/C, power windows, big bumpers and an automatic. Too little , too late. Here in Europe we get the Volumex which had a supercharger. It was a much better design but did not offer much power increase.